All forecast eyes in the last several days have been on a developing tropical storm, now hurricane, currently churning near the island of Jamaica. Hurricane conditions are expected in Jamaica, eastern cuba, and tropical storm/hurricane conditions are possible for the Bahama’s and coastal Florida. From there on considerable uncertainty had been an understatement to describe the potential downstream affects of this storm. A highly anomalous upper air exists over much of the region. A deepening trough crossing the country, a large blocking Atlantic ridge over Greenland as well as another escaping trough in the central atlantic well south and east of the canadian maritimes are among many variables that have made this a difficult forecast. 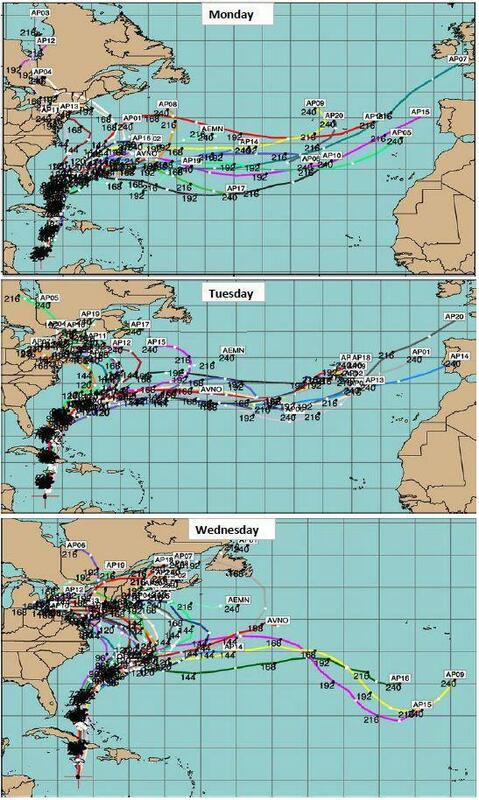 To give you an idea, here is the progression of the GFS ensembles during the past 3 days. One of the reasons the models handle the forecasts so poorly out 7 days in advance is that when a stormy scenario like this is coming together, features from halfway across the world can come into play. Some of these areas, like the pacific ocean have significantly less measured data because of their locations, so our ability to properly represent this can be flawed. Since the event is coming more within range, the national weather service has actually upped continental US balloon launches from the typical twice a day 00z/12z to four times a day (00z/06z/12z/18z). This should help improve model forecasts as we try to get a better handle on the specifics of this event. Here’s my current thinking: The trend since Monday as we have gotten closer to the event is away from a scenario in which the storm takes a path out to sea, and closer to one that brings impacts to the northeast – perhaps substantial. This is the result of an anomalous scenario in which tropical cyclone sandy would be forced up the coast by blocking high pressure near the labrador sea and then steered by a deepening trough over the eastern half of the continent. The size of this storm is expected to be massive so it’s important not to focus solely on the track of the low pressure center. Sandy will have an exceptionally large wind field and heavy rain impacts are almost certain to be felt over most of the region. Interests in all of New England and the Mid-Atlantic should closely monitor subsequent forecasts because a hit from this storm could potentially be historic in magnitude. The main time period of concern is sometime Monday-Wednesday next week depending on the progression of this storm. Specific details about the track will be able to be conveyed with more confidence tomorrow and Friday.